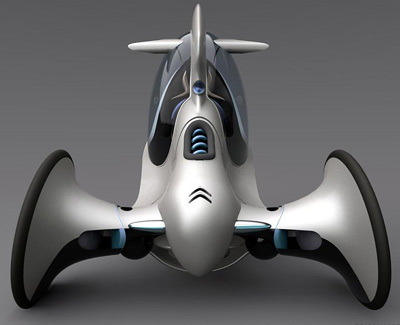 The Citroen E-3POD Antistatic is an officialy sanctioned Citroen design which was created by Royal College of Art student Heikki Juvonen. 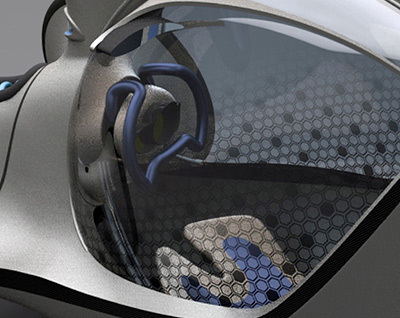 The 'Double Challenge' project which inspired the E-3POD Antistatic asked Royal College of Art (RCA) MA second year students to design a ground-breaking ultra-compact vehicle that displayed a unique design aesthetic for future Citroen's. The project was jointly sponsored by Citroen and EXA, a French aerodynamic simulation software company. 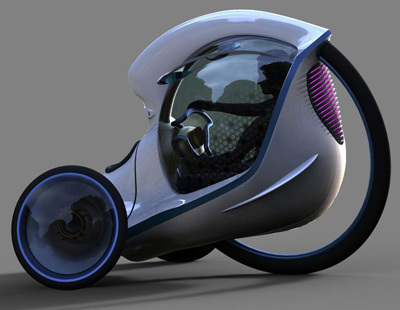 The E-3POD Antistatic concept by Juvonen was selected as the best overall design by staff and representatives from Citroen's Style Centre and Electric Vehicle Development Team. The prize for Juvonen was a six month employment contract at the PSA Design Center in Paris. The appearance of the Citroen E-3POD Antistatic is defined by the unique three wheel layout. 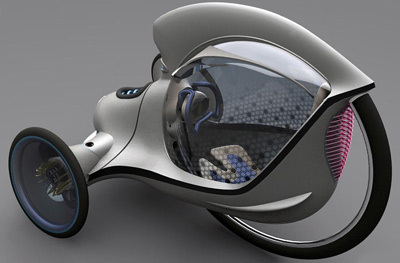 The vehicle features two smaller wheels at the front, with the driver sitting inside a larger third wheel with an innovative hub-less design. 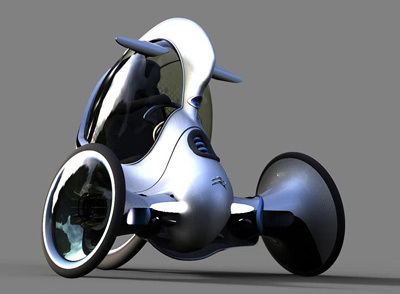 The ultra-light, micro segment, single-seat E-3POD Antistatic is not designed to replace cars, but instead it is supposed to provide an alternative to cars or bikes - which many E-3POD customers may also own or regularly use. With the E-3POD, the driver can enter the world of electric vehicles without having to sacrifice their main means of long distance travel in internal combustion engine cars. The distinctive, slightly quirky appearance of the E-3POD Antistatic is designed to help prevent the vehicle from being compared directly to cars - to avoid comparisons in terms of operational range or refuelling/recharging time. The E-3POD has a simplified, lightweight construction with an emphasis on aerodynamics to minimize the required battery size. This lowers the production costs, making the E-3POD affordable for purchase in addition to the family car - and a potential means of commuting for young people and students. The lowered weight is emphasized in design elements such as the rear wheel, which works as a supportive structural element, the shared suspension for both front wheels, and the use of scratch resistant plastic for the canopy. The silent electric engines also make sound insulation redundant, allowing for lighter material selection. At higher speeds the E-3POD tilts slightly in the corners to provide improved grip and a more involving driving experience.